In the post below I kept a running list of news/events/analysis related to the death of former North Korean leader, Kim Jong-il, and the political rise of his son, Kim Jong-un. I believe I have been pretty thorough, but if there is something I missed, please let me know. UPDATE 70 (2012-2-14): A Kim Jong-il statue was unveiled at the Mansudae Art Studio in Pyongyang. UPDATE 69 (2012-2-9): Kim Jong-il’s name has been carved into a mountain in South Pyongan Province. UPDATE 68 (2012-1-28): Daily NK–North Korean construction costs incurred through the creation of statues of Kim Jong Il and the eternal tower is a burden to the people, multiple internal sources say. 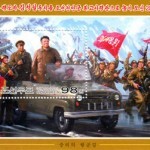 UPDATE 67 (2012-1-12): Kim Jong-il’s body to be preserved for posterity. Andrei Lankov writes in the Asia Times about the history of the tradition–citing even “economies of scale” in the business. Yonhap reports that a Kim Jong-il statue and immortality towers will be built. 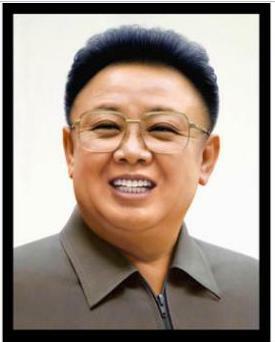 Kim Jong-il’s birthday to be named “Day of the Shining Star”. The Daily NK has more here and here. 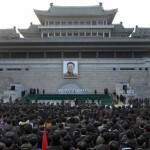 UPDATE 66 (2012-1-10): DPRK troops swear loyalty to new leader Kim Jong-un in rally at Kumsusan Palace. 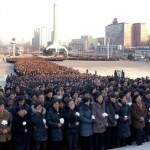 UPDATE 65 (2012-12-30): Here is video of mass rallies, cannon shots, and a moment of silence held across the DPRK for Kim Jong-il. 2. The Kim Jong-il era is over. The Kim Jong-un era begins. 3. North Koreans vow allegiance to new leader. 4. Ri Myung Hun (Michael) was seen at the funeral. 5. Here is the two-hour funeral video as seen on NK television. 6. Adam Cathcart found some Kim Jong-un propaganda in a Chinese magazine. 7. Ju Kyu-chang, the man in charge of the DPRK’s missile program and maybe the nuclear program attended paid last respects to Kim Jong-il. Officially, Ju is director of the KWP Machine-Building Industry Department, which he has been associated with since the 1960s. But his power stems from the NDC post and also his being named to the Workers’ Party Central Military Commission in 2010. 8. Some South Koreans mad an illegal (under South Korean law) visit to the DPRK for the funeral. 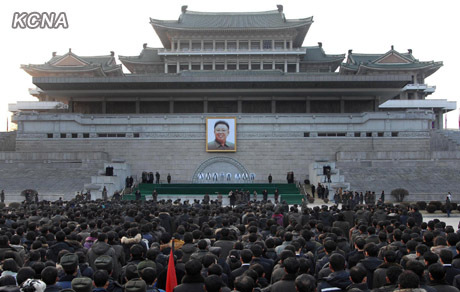 UPDATE 63 (2012-12-28): On this day Kim Jong-il’s funeral was held and Kim Jong-un was named “supreme leader” of the party. 1. The funeral procession: Yonhap published a helpful map of the funeral procession here. It was incorrect, however, so I posted a corrected version here. 2. 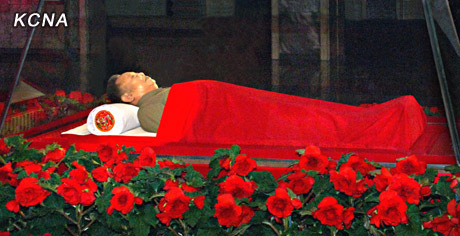 Kim Jong-il’s body will remain preserved in Kumsusan Palace. 3. KEI coverage of the funeral. 4. 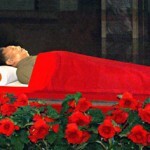 Kim Jong-il carried to the grave in a US-made Lincoln Continental. 5. 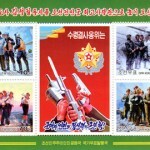 The DPRK doctored photos of the funeral procession that were given to Kyodo and the Associated Press. See more here. 6. Russian Scientists who preserve the corpses of Lenin, Ho Chi Minh, and Kim Il-sung are in Pyongyang working on Kim Jong-il. 7. Nick Frisch on the funeral music. Prices in North Korea’s jangmadang are much the same now as they were when the markets were shuttered immediately after news of Kim Jong Il’s death was made public on December 19th. Rice, often employed as a barometer for North Korea’s overall market conditions, was trading for around 4,500 won/kg in cities along the Sino-North Korean border yesterday. Having reached a high of 5,000 won in the weeks before Kim’s death but then falling back to 4,000 won nearer the 19th, the latest price is well within the levels which might have been expected, and certainly does not suggest much fear in the market going into today’s funeral for the former dictator. According to sources, the modest fall back to 4,500 won is just a natural result of product circulation in the market, something that is also reportedly reflected in other products. 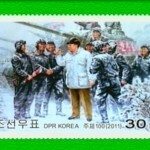 After the death of Kim Jong Il, the shaky political situation has destabilized prices in North Korea. The price of rice is reported to have doubled recently. Immediately following the news of Kim Jong Il’s death, travel between China and North Korea and the gathering of people were strictly prohibited. In addition, markets in certain areas were temporarily closed. The price insecurity and closure of markets are adding to the dissatisfaction of the people. Merchants are selling food items secretly in black markets. Recently in North Hamgyong Province and North Korean cities that border China, the price of one kilogram of rice has exceeded 5,000 KPW. The price of rice that sold for 4,000 KPW at the end of November has risen by 1,000 KPW in less than a month. The Chinese yuan–North Korean won exchange rate has also changed, from 700 KPW to 800 KPW in Haesan and Musan, and to 1,000 KPW in Hoeryong. With continuous escalation of prices with the stronger regulations and crackdowns being enforced, the voices of discontent seem to be growing. Rumors are quickly spreading that the price will continue to rise, adding further confusion for the people. After the failed currency reform, confidence in the North Korean currency continued to decline, leading to the soaring of the Chinese yuan, which consequently caused the price of rice to rise. While the rice supply in the markets has remained relatively steady, the price continued to rise from the rising value of the yuan. Among the North Koreans, the yuan has become the currency of choice for trading and for private hoarding. An increasing number of people are buying rice to store. Even the North Korean authorities are believed to be buying foreign currency, mostly USD and CNY from domestic trading companies at a higher exchange rate. Recently, North Korea is exchanging foreign currency brought in by domestic trade companies with its domestic currency at a much higher rate through the Foreign Trade Bank of Korea. It is speculated that this is being done in effort to accumulate enough foreign currency necessary to carry out various events in 2012, including the completion of the construction of 100,000 housing units in Pyongyang. As the confidence for the North Korean currency declines, the US dollar and Chinese yuan seem to be the preferred currency in the markets. Similarly, most trading companies are choosing to keep foreign currency for operating funds. This is not the first time that North Korean government has attempted to obtain hard currency through its domestic trading companies and money brokers. Whenever the government took such measures to attain foreign currency, exchange rates would soar, which consequently caused prices to rise and affected the lives of its people negatively. The cause of the recent inflation is also blamed on the recent government measure to obtain more hard currency. The DPRK government is forcing businesses and trading companies to deposit all the foreign currency earned in the trade bank. However, most companies prefer to hold on to their foreign reserves in cash to avoid complex deposit and withdrawal processes. They also seem to be using private money brokers to exchange money. Recognizing this, North Korean authorities have been cracking down on such illegal “private money exchangers” every year. 9. 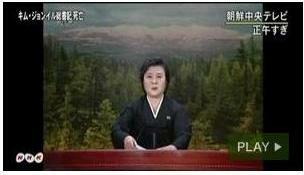 Uriminzokkiri uploaded nine videos of people mourning Kim Jong-il: one, two, three, four, five, six, seven, eight, nine. 1. South Korean mourners return home. 2. Yonhap on the natural phenomenon related to Kim Jong-il and Kim Jong-un. 3. NKs paint a picture of stability. 4. Intellligence and security agencies demonstrate loyalty to the new leader. 5. North Korean markets re-opened on Christmas day. 8. Uriminzokkiri videos: Mourning in Pyongyang, Pyongyang gymnasium, Kim Il-sung Square, Hungnam Fertilizer Complex, Namdok Coal Mine, Sinchon, Pukchang power plant, Janggang County, Koryo academy, Songchon Complex, Mangyongdae District, Sopho Chicken Farm, Kim Il-sung Square, Pyongyang Gymnasium, Kang Pan-sok Revolutionary School, Kim Il-sung Square, Tongil Street, 4.25 House of Culture, Kim Il-sung Square, 4.25 House of Culture, Party founding Monument, Pyongyang Gymnasium, Kumsusan one, two, three, four, 4.25 House of Culture, Pyongyang Meat Shop, Kim Il-sung Square, mourning, foreign news coverage, natural phenomenon, foreign news coverage, foreign news coverage, Russian Orthodox church. 9. South Korean funeral delegation relays DPRK desire to restart scuttled inter-Korean projects. 1. South Korean Unofficial Delegation in North as Son Elevated: BusinessWeek, Bloomberg, BBC, Yonhap, New York Times. 2. KCNA: People Regrettable for Not Having Set up Kim Jong Il’s Statue. 3. Kim Jong-un visited Japan as a child. 4. Uriminzokkiri videos: Mourning at 4.25 Palace of Culture and Kim Il-sung Square, people mourning at home, mourners at Kim Il-sung Square, Kim Il-sung Square, Rason, Namhung Youth Chemical Complex, National Academy of Science, Kumsusan, Chinese news coverage. 1. Uriminzokkiri uploaded the following videos: Womens’ Uion and Paektusan employees, Kim Il-sung Political University, KPA Unit, Pyongyng Indoor Gymnasium, Kim Il-sung Military University, Taedonggang Fruit Farm, KPA Unit, Kumsusan, Foreign press coverage, people mourning. South Korea and China will hold high-level talks in Seoul this week to discuss the situation on the Korean Peninsula and North Korea’s nuclear program following the death of its leader Kim Jong-il, the foreign ministry here said Sunday. The one-day annual meeting, scheduled for Tuesday, will be led by South Korean First Vice Minister Park Suk-hwan and his Chinese counterpart Zhang Zhijun, the ministry said. This year’s meeting, the first to be held after Kim’s abrupt death last week, is expected to touch on future plans regarding the communist state and discuss how to continue diplomatic efforts to revive the six-party talks on Pyongyang’s nuclear weapons program, according to officials. The death of the secretive leader put a brake on a flurry of renewed diplomatic efforts to resume the long-stalled six-party talks, which have been dormant since the last session in late 2008. The nuclear talks involve the two Koreas, China, Japan, Russia and the U.S.
Before Kim’s demise, North Korea had been expected to announce that it would suspend its uranium enrichment program and accept U.N. nuclear monitors in exchange for food aid. Such North Korean moves are preconditions set by the U.S. and South Korea for resuming broader six-party talks. 3. Jang Sung-thaek seen in military uniform. 4. Kim Jong-un apparently named as supreme commander. 1. 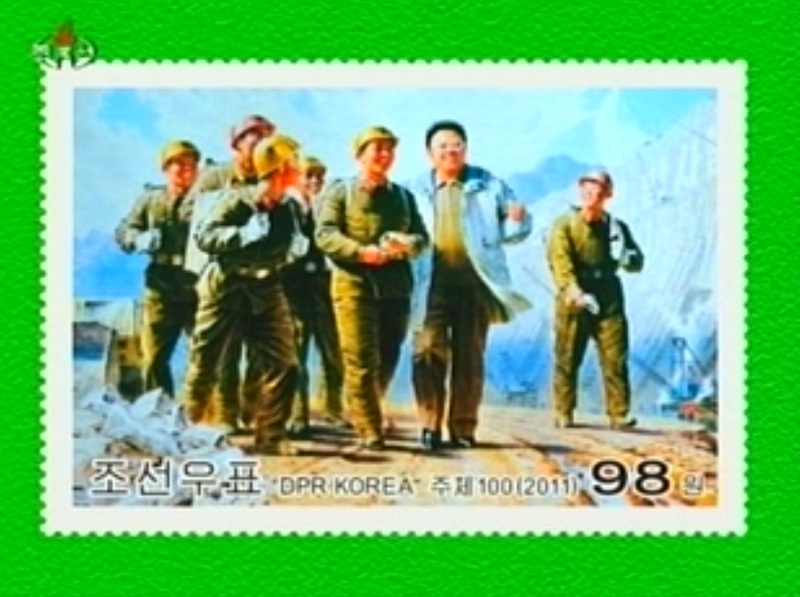 Uriminzokkiri uploaded many videos of people mourning: Academy of Social Science, Rason, Chongjin, Chongsan Farm, Kangso water Factory, Munchon Middle School, Kumsusan Memorial Palace, Kim Il-sung Square, Okryu Restaurant, KPA unit (huchon Dam construciton workers), Kim Il-sung Square, Rakwon Machine Tool Factory, Construction Planning Office, South Hwanghae Party office, Kim Il-sung Square, 4.25 House of Culture, Phyongsong, Sariwon, Haeju, Kumsusan 1, Kumsusan 2, Kumsusan 3, Kumsusan 4, Kim Jong-un visits bier, foreign press coverage. 2. 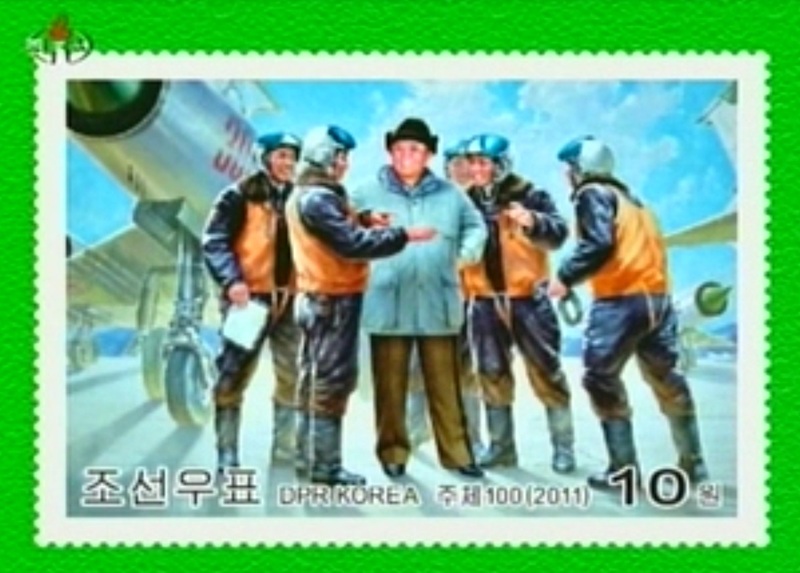 Uriminzokkiri also uploaded some videos of Kim Jong-il’s revolutionary activities. Video 1, Video 2, Video 3. South Korea’s Unification Ministry belatedly confirmed Friday that another group visited North Korea via land route in December last year to pay condolences over the death of the North`s late leader Kim Jong Il. The government had said that it allowed just the widow of former President Kim Dae-jung and the family of the late Hyundai Group Chairman Chung Mong-hun to go to Pyongyang to pay their respects to Kim Jong Il. The ministry said three Korean Americans — Moon Hyung-jin, international president of the Unification Church; Park Sang-kwon, CEO of Pyeonghwa Motors; and Douglas D.M. Joo, chairman of The Washington Times — crossed the inter-Korean border Dec. 24 to go to Pyongyang, which came two days prior to the visit by Kim Dae-jung’s widow and Hyundai Group Chairwoman Hyun Jeong-eun. Those wishing to visit North Korea via land route are required to get prior approval from the ministry under an inter-Korean agreement. The visit request is relayed to North Korea after approval from the U.N. Command via the South Korean Defense Ministry. If Pyongyang accepts, they can cross the border. 1. NK Leadership Watch posts pictures of a woman presumed to be Kim Jong-un’s sister. 2. Andrei Lankov: “Successor Failure” in the Wall Street Journal. 3. The Economist on the DPRK consulate in Dandong, China. 4. Wall Street Journal: Did Chinese have to cry to catch a train out of the DPRK? 5. Ken Gause: Decision-making in post-Kim Korea. 7. Stratfor on the death of Kim Jong-il (via ROK Drop). 8. Princess Tenkohas been invited to Kim Jong-il’s funeral. Here is her Wikipedia page. Pyongyang, December 23 (KCNA) — The participants in the plenary meeting of the 66th UN General Assembly on Dec. 22 mourned over the demise of Kim Jong Il, leader of the Democratic People’sRepublic of Korea. Nassir Abdul Aziz Al-Nasser, president of the UNGA, proposed to all those present at the meeting to express condolences over the demise of Kim Jong Il, general secretary of the Workers’ Party of Korea, chairman of the DPRK National Defence Commission and supreme commander of the Korean People’s Army. 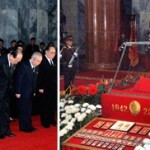 The attendants paid one minute’s silent tribute to the memory of the leader. Pyongyang, December 23 (KCNA) — U.S. Rev. Billy Graham, Rev. Franklin Graham who is president of Samaritan’s Purse, a non-governmental organization, and Robert Springs, president of Global Resource Services, a non-governmental organization, and his wife Babara Springs sent a floral basket and wreath to the DPRK permanent mission at U.N. Wednesday on the demise of leader Kim Jong Il. Bill Richardson, former governor of New Mexico State, requested the U.S. government to express condolences over the demise of Kim Jong Il. He in a Tuesday TV show including ABC TV said the U.S. government should express official condolences to the DPRK. Kim Jong Un, vice-chairman of the Central Military Commission of Workers’ Party of Korea, made sure that special transport measures were taken and let officials in Pyongyang and local areas take charge of the supply in the field, saying the loving care of Kim Jong Il should reach the people as soon as possible even though it is a mourning period. Officials and commercial service workers are now making sure that those fishes are supplied to every household in the city. Salespersons and citizens burst out sobbing at fish shops in the capital city Friday. Officials in the commercial service field in the city pledged their loyalty for Kim Jong Un, saying the history of loving care for the people continues and no people on earth are blessed with leaders and generals as the Koreans. Pyongyang, December 23 (KCNA) — Fresh fish associated with leader Kim Jong Il’s deep concern began to be supplied to the Pyongyang citizens seized with grief at his demise. Great Comrade Kim Jong Un took a special measure to transport fresh fish to Pyongyang in time and supply them to the citizens. 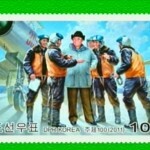 Both salespersons and inhabitants were deeply moved by Kim Jong Il’s deep care for the citizens. Pyongyang, December 23 (KCNA) — The supply of fishes to Pyongyang citizens began Thursday at this sad time of national mourning. Leader Kim Jong Il worked heart and soul to supply the people with fresh fishes the year round while giving tireless field guidance to fisheries bases on the eastern and western areas, commercial service centers and related units during his lifetime. Earlier this year he made sure that pollacks and herrings were supplied to the Pyongyang citizens. At sandfish season this November he instructed officials to swiftly catch sandfish and send them to the people. On the evening of Dec. 16, just a day before his demise, he took a step for the fish supply. 2. KCNA also uploaded a video of North Koreans crying in the Kwangbok Street Curcus Plaza. The video also showed “volunteers” sweeping the snow from the plaza. You can see the video here. 3. Uriminzokkiri uploaded three videos of Kim Jong-il to their Youtube Page. Video 1, video 2, video 3. They also uploaded nine more crying videos which I cant be bothered to add here. 1. 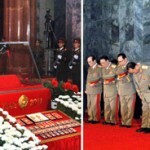 Luke Herman compares the Kim Jong-il funeral committee list with the Jo Myong-rok committee. 2. Reforms of North Korea’s economy may languish as new, young leader consolidates power. The defaulted bonds, which were created in 1997 when French bank BNP repackaged a series of non-performing syndicated bank loans that were granted to North Korea in the seventies, have suddenly sparked interest among speculators. The sporadically traded bonds, which trade at a deep discount to their face value, saw a tick up this week and were recently quoted at between 14 and 18 cents on the dollar, compared with 13 to 15 cents, according to London-based sales and brokerage house Exotix. Pyongyang, December 22 (KCNA) — More natural wonders have been observed in different parts of the country since it was shocked by the sad news of the demise of leader Kim Jong Il. On Wednesday people in the villages near the Military Demarcation Line including Sinhung, Ryongjong, Haephyong, Phungdok and Ryongsan-ris in Kaesong City observed natural wonders. There were a series of blinding blue flashes accompanied by thunder with an interval of five minutes in the air south of the city wrapped with heavy fog from around 04:00 when heavy snow began falling down to 05:00. This is something unusual in mid winter. Witnessing this, citizens of the city said that the demise of Kim Jong Il was so heart-rending that even the sky seemed to writhe in grief. He was, indeed, a great saint born of Heaven, they added. Pyongyang, December 21 (KCNA) — Peculiar natural wonders were observed on Mt. Paektu, Jong Il Peak and Tonghung Hill in Hamhung City where the statue of President Kim Il Sung is standing at a time when all Korean people are mourning the demise of leader Kim Jong Il in bitterest sorrow. On the morning of Dec. 17 layers of ice were broken on Lake Chon on Mt. Paektu, shaking the lake with big noise. The temperature on Mt. Paektu that day registered 22.4 degrees centigrade below zero and there was strong wind accompanied by snowstorm measuring 18 meters per second. The snowstorm stopped blowing all of a sudden from dawn of Tuesday and heavy clouds were seen hanging around Hyangdo Peak. Kim Jong Il’s autographic writings “Mt. Paektu, holy mountain of revolution. 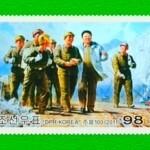 Kim Jong Il.” carved on the mountain, in particular, were bright with glow. At around 21:20 Tuesday a Manchurian crane was seen flying round the statue three times before alighting on a tree. The crane stayed there for quite a long while with its head drooped and flew in the direction of Pyongyang at around 22:00. 2. KCNA also published several more videos: People overcome with grief (9) at the Pyongyang Circus, People overcome with Grief (10) at the Monument to the Party Founding, Korean People Change Sorrow into Strength (Chollima Steel Complex/Taean Heavy Machine Complex), and Korean People overcome with grief (11)–Pyongyang indoor stadium. 3. Uriminzokkiri uploaded dozens of videos to their YouTube account: Mourning in provincial capitals, Children’s Foodstuff Factory, Crying in Kamsusan Palace (including Kim Jong-un receiving line) here, here, here and here, Sonhung Foodstuff Factory, Monument to Party Founding, Kim Il-sung Socialist Youth League Headquarters, Kim Il-sung Square, 4.25 Palace of Culture, Kwangbok Supermarket, a DPRK rebroadcast of Chinese Central Television, and a documentary of Kim Jong-il’s life. UPDATE 54 (2011-12-21): Reports and analysis. 1. The Korea Society hosted a panel discussion with Thomas Hubbard, Charles Armstrong, Gordon Flake, and Dr. John Park. Watch it here. 2. Nicholas Eberstadt writes a summary of Kim Jong-il’s political career in the Los Angeles Times. 3. Barbara Demick , writing in the Los Angeles Times, interviews North Korean defectors who discuss the public mourning process in the DPRK. 4. This Korea Herald article speaks with representatives of PSCORE, Choson Exchange, the Fuller Center, and Tim Peters, and Network for North Korean Democracy and Human Rights. North Korea will shift to collective rule from a strongman dictatorship after last week’s death of Kim Jong-il, although his untested young son will be at the head of the ruling coterie, a source with close ties to Pyongyang and Beijing said. The source declined to be identified but has correctly predicted events in the past, telling Reuters about the North’s first nuclear test in 2006 before it took place. 1. The Daily NK posted two stories on how the death of Kim Jong-il is different than the death of Kim Il-sung. Here is article one. Here is article two. The North Korean authorities have apparently decided to allow a limited number of ‘grasshopper traders’, people who sells their goods without a stall in the streets around official markets and other busy locations, to operate in the aftermath of the death of Kim Jong Il. The authorities closed the official markets immediately following Monday’s announcement, chasing away all the grasshoppers in the process. However, the closure of the market would have been a huge blow for the public, given that it has been the main source of most people’s food and daily essentials in modern-day North Korea for more than ten years. As such, the toleration of grasshoppers is very welcome. A source from Yangkang Province told The Daily NK on Wednesday, “There was no official order to go out and trade, but they aren’t cracking down on those people working in front of the train station or in alleyways, either.” According to the source, the grasshopper traders are selling small amounts of food and cigarettes. While rice prices had reached 5,000 won/kg in places a week or so prior to Kim’s death, they had begun to fall again; just before the death of Kim Jong Il was announced, local rice was around 4,000 won/kg and 3,000 won bought a packet of cigarettes. However, the death has seen both spike significantly. The previous alternative following the closure of the markets had been to live day to day on necessities bought from unsanctioned, small-scale sales locations known as ‘village stalls’. These locations are similar in scale to a convenience store and, like a convenience store, they trade on convenience at high prices. Based in private homes, they only advertize themselves in very furtive ways but local residents all know where they are and can buy what they need in an emergency, such as when the authorities close the markets. Ordinarily, they only serve those elderly, infirm or incapable of travelling to cheaper, but more distant, official markets. According to one source, however, village stallholders were and are being extremely careful because they fear having their goods confiscated and then being punished after the mourning period is over. As a result, they are only selling to people they know. Update 52 (2011-21-21): South Korea.The DPRK has expressed an interest in pushing forward with the Manwoldae restoration project (Yonhap). See background here and here. Yonhap also reported that South Korean President Lee Myung-bak expressed his hopes that North Korea will overcome the death of Kim Jong-il so that peace will be maintained. See the article here. See previous South Korean responses below in Update 47 and 36. 1. Here is the remainder of KCNA posts that were added this afternoon (PDF–nearly 7 pages single spaced). 2. KCNA also added two more videos of North Koreans crying: Video 1 (Kim Il-sung Square), Video 2 (Hana Joint Venture Co. where Kim Jong-il made one of his last public appearances). 3. Urimonzokkiri also uploaded too many videos for me to watch today–all of Koreans crying: video 1, video 2, video 3, video 4, video 5, video 6, video 7, video 8. See previous articles and analysis in UPDATE 43 and UPDATE 23 below. 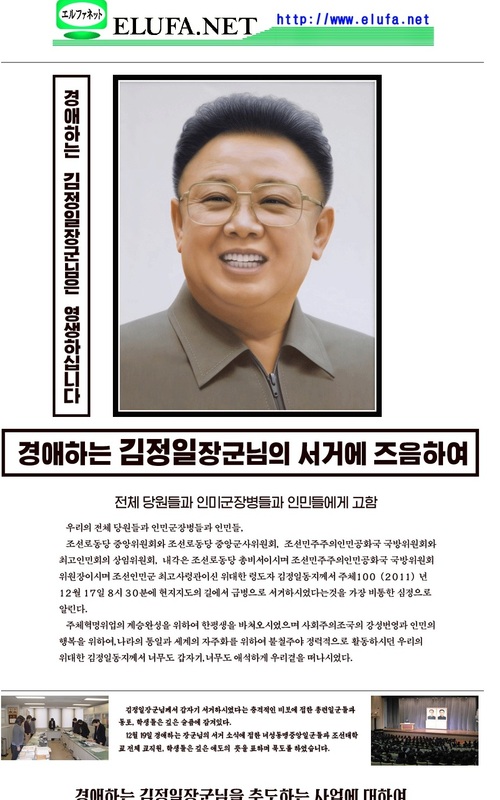 UPDATE 48 (2011-12-21): Some time ago, I posted Kim Jong-ils only public address to YouTube. This is the only time most North Koreans ever heard his voice. You can see it here. A caretaker leadership led by a Workers’ Party commission under the control of the chosen son of late North Korean leader Kim Jong-il is expected to handle pressing issues in the communist nation until the successor takes full control, South Korea’s main spy agency has forecast. The National Intelligence Service made the forecast in a report to parliament Tuesday, saying Pyongyang is expected to focus on a smooth power transition to Kim’s youngest son, Kim Jong-un, according to participants. The Washington Post also reported on this claim. 1. KCNA news for the day in PDF (nearly 19 pages–single spaced). 2. KCNA uploaded another video of people mounring at Kim Il-sung Square, and construction workers on Mansudae Street who vow to continue building a thriving nation. 3. Uriminzokkiri uploaded several videos: This documentary on Kim Jong-il’s orders, this documentary of his life and work (Chol Pass), People crying at the Pyongyang Indoor Stadium (satellite image here). Articles and commentary by other policy analysts and North Korea experts can be found in “UPDATE 23” below. Pyongyang, December 20 (KCNA) — From noon on Dec. 19 when the sad news of leader Kim Jong Il’s demise was reported to the noon next day a total of more than five million citizens of Pyongyang visited the statues and portraits of the peerlessly great persons and mosaics depicting them and other places to mourn his demise. An endless stream of people from all walks of life visited the statues of President Kim Il Sung standing on Mansu Hill [Satellite image here], Ryongnam Hill [Kim Il-sung University, satellite image here], Jangdaejae Hill [Pyongyang Students and Children’s Palace, Satellite image here] and other places to express condolences over his demise. Those engaged in the construction of Mansudae area, officials of ministries and national institutions and students of Kim Il Sung University and Kumsong Secondary School No. 1 rushed there in bitter grief. The number of mourners thronging to Mansu Hill increased as time went by. Around 3 p.m. they packed not only the ground before the statue of the President but the road stretching to it from the construction site. The mourners’ number reached 450 000 at dawn on Tuesday and it went beyond 800 000 at noon. They were grieving over his demise in bitter sorrow. Among them were those who could not stand to their feet. Countless women, young and old, were in their mourning clothes with white ribbons on their heads. 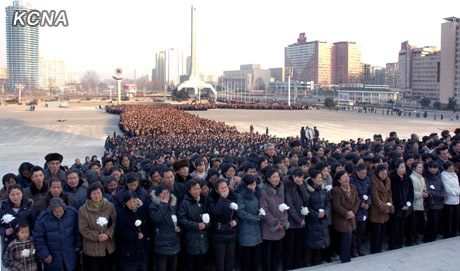 According to the most recent census of the DPRK (2008), the population of Pyongyang was only 3,255,288 (significantly less than the 5 million reported above–unless people were visiting more than one grieving party. Additionally, since the census was conducted, Pyongyang’s land area has shrunk by nearly 1/3, so the population is officially smaller than in 2008. 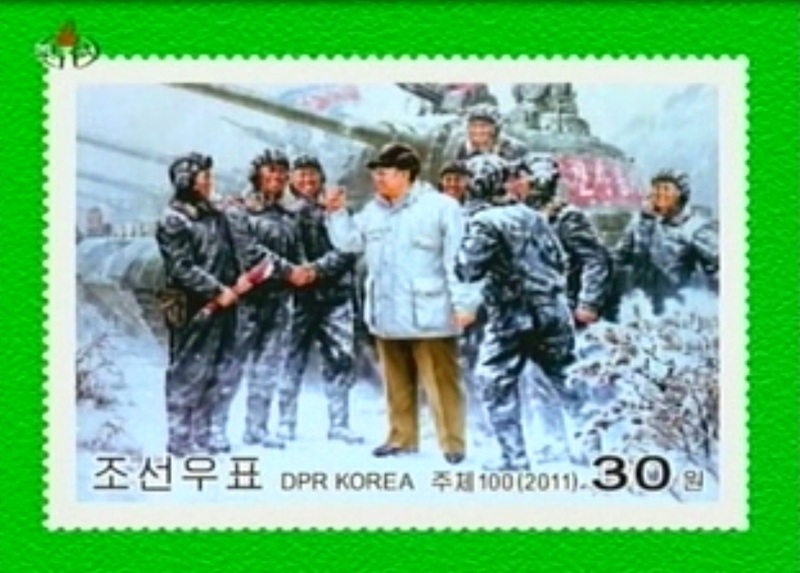 UPDATE 39 (2011-12-20): AP video from Pyongyang can be found here. It features Rafael Wober, whom I have not seen since I visited the DPRK in 2005! North Korean workers at the factories in Gaeseong went home early at 3 p.m. Monday upon the North’s request, but are to come to work as usual Tuesday, Seoul’s Unification Ministry spokesperson Choi Boh-seon said, citing a North Korean official. The ministry on Monday banned South Koreans’ visits to the North, with the exception of the industrial complex. South Korean staff returning home from Gaeseong on Monday afternoon said the North Korean employees were greatly shocked at the news of Kim’s death. Most North Korean workers gathered around 2 p.m. to mourn his death and went home early, according to a South Korean employee. “We are preparing to run the factory as usual tomorrow, but we don’t know for certain whether there might be some impediment in production,” an official of a company operating in Gaeseong said. Kim Ki-mun, chief of the Korea Federation of Small and Medium Business, said companies in Gaeseong were expected to do business normally, although there is the possibility of tighter control on entrance to the complex. “I don’t think there will be a major commotion in the Gaeseong industrial park,” said Kim, who is also the chief executive of Romanson, a South Korean watchmaker that runs a factory in Gaeseong. Kim had visited the Gaeseong complex last month with 14 vice chairmen of the federation. Companies in Gaeseong called on Kim to take steps to ease their shortage of funds and manpower, prompting him to deliver their requests to South Korean government officials, according to Kim. “The federation will keep watching the situation and do our best to assist the companies,” he said. An official of a company that entered the complex five years ago said if the North Korean regime’s instability intensifies, it could deal a blow to the South Korean firms in Gaeseong in the short-term. This is what the head of a company operating a plant at the Kaesong industrial complex in North Korea said after hearing news of the death of North Korean leader Kim Jong Il from a staff member who entered the North from South Korea at 5 p.m. Monday. According to the heads of multiple companies, North Korean workers learned belatedly of Kim`s death at 1 p.m. the same day given the lack of TVs installed in their production lines. According to the company head, North Korean workers were considerably shocked to hear of Kim`s death but continued their daytime shift until the end of the business day. Workers gathered in groups of three or four and held chats with a serious look during breaks, but did not cry or show marked signs of indignation. Apart from this, the association of companies operating in the complex held a meeting of senior staff presided over by association chief Bae Hae-dong at its Seoul office around 5 p.m. Monday. If North Korean authorities request that they stop operations through the day of Kim`s funeral on Dec. 28 to allow workers to attend memorial events, the companies will approve. The head of another company operating in Kaesong said, “The Kaesong industrial complex didn`t stop operations even when North Korea conducted nuclear tests,” in expressing cautious optimism. South Korea’s Kospi rose 0.9% to 1793.06, after sinking 3.4% Monday. 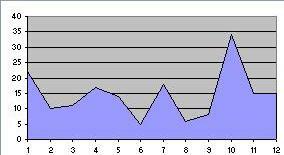 Japan’s Nikkei Stock Average gained 0.5% to 8336.48 and Taiwan’s Taiex added 0.4% to 6662.64. Elsewhere, Australia’s S&P/ASX 200 index fell 0.2% to 4053.10, China’s Shanghai Composite dropped 0.1% to 2215.93 and Hong Kong’s Hang Seng Index rose 0.1% to 18,080.20, after each index changed direction a few times. South Korea expressed sympathy to the people of North Korea over the death of leader Kim Jong-il, but decided not to send an official condolence delegation to the communist nation, an official said Tuesday. The government will, however, allow the families of late South Korean President Kim Dae-jung and late Hyundai Group chairman Chung Mong-hun to pay condolence visits to the North because Pyongyang sent delegations to Seoul when Kim and Chung died, Unification Minister Yu Woo-ik said. “Regarding the death of Chairman Kim Jong-il, the government conveys sympathy to the people of North Korea,” Yu said while briefing reporters on the outcome of a security ministers’ meeting that President Lee Myung-bak presided over to discuss the aftermath of Kim’s death. The expression of sympathy to the people of the North was a carefully chosen phrase aimed at reconciling conflicting demands from conservatives and liberals in South Korea over whether to offer condolences over the death of the leader of a nation South Korea is still technically at war with. The wording is aimed at separating the North’s leadership and its hunger-stricken population. The government does not want to anger either side at a time when general elections are just months away. The government will allow the families of late President Kim and late Hyundai chief Chung to visit the North for reciprocal condolence calls. Kim held the first-ever inter-Korean summit with the late North Korean leader in 2000, and Chung pushed aggressively for joint economic projects with the impoverished North. Pyongyang sent condolence delegations to Seoul when Kim died in 2009 and Chung died in 2003. Yu said that South Korea has been working closely with friends and allies to make sure that “peace on the Korean Peninsula is not shaken.” The South’s military is maintaining high vigilance and is prepared for all kinds of situations, he said. “So far, no unusual signs whatsoever have been detected in North Korea,” he said. Yu also said that the government is asking religious groups to withdraw their plans to light Christmas tree towers on the border with North Korea. The request reflects concern that the lighting could provoke Pyongyang and spike tensions. Later Tuesday, the defense ministry said religious groups accepted the government’s request to keep the towers dark this year. A ministry official said Yoido Full Gospel Church and the Military Evangelical Association of Korea, which had organized the lighting ceremony, agreed not to light the Christmas towers, after the ministry verbally notified them of the government’s stance. The ministry will send a written request later Tuesday or early Wednesday, the official added. The head of South Korea’s National Intelligence Service (NIS) on Tuesday expressed cautious doubts over the time and location of North Korean leader Kim Jong-il’s death, parliamentary officials said, raising questions over whether the communist North tried to beautify Kim’s death. Attending a special session of the National Assembly Intelligence Committee, NIS chief Won Sei-hoon said a special train used by the late North Korean leader was spotted stationary at Pyongyang’s train station at the time of his death announced by the North, according to the parliamentary officials. The time and place of Kim’s death may be very sensitive to North Korea’s remaining leadership, which is apparently trying to ensure successful succession of power to Kim’s youngest son Jong-un on the late leader’s legacy. He refused to comment, however, on what a ruling party legislator on the parliamentary committee called a rumor about Kim’s death at his official residence in Pyongyang, saying it was a report that has yet to be confirmed. This Choson Ilbo story asserts the train is still parked at the Ryongsong compound. I have previously posted location’s of Kim’s train station including the main station in Ryongsong. See them all here. Pyongyang, December 20 (KCNA) — Portraits of smiling leader Kim Jong Il were displayed at Kim Il Sung Square, the plaza of the April 25 House of Culture, the Party Founding Memorial Tower, the plaza of the Pyongyang Indoor Stadium and other places of Pyongyang Tuesday. They were crowded with an endless stream of people carrying with them wreaths, bouquets and flowers prepared with sincerity. Roads leading to those places and residential areas contiguous to them became crowded with mourners in a minute. These places turned into a veritable sea of mourners who bitterly wept, looking up to portraits of smiling Kim Jong Il. 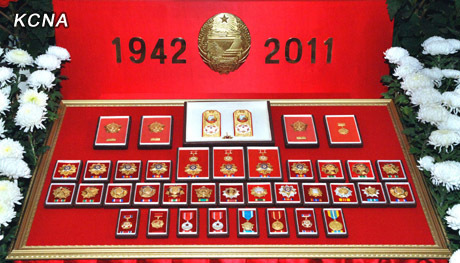 Similar portraits were also displayed on the front walls of the Pyongyang Circus Theater and the Hana Music Information Center. Pyongyang, December 20 (KCNA) — A solemn ceremony took place in Pyongyang Tuesday to mourn before the bier of Kim Jong Il, general secretary of the Workers’ Party of Korea, chairman of the DPRK National Defence Commission and supreme commander of the Korean People’s Army at a time when the whole country is in the bitter sorrow at the unexpected sad news of his demise. 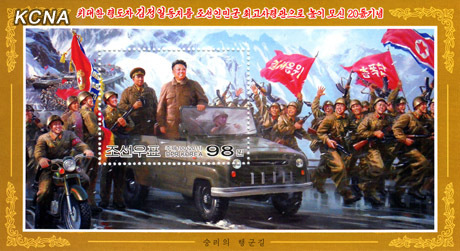 Marked on the front of the bier were the years of “1942-2011” as well as the national emblem of the DPRK. Members of the National Funeral Committee were standing guard by the side of the bier and guards of honor of the three services of the Korean People’s Army and the Worker-Peasant Red Guards were standing on either side of the bier. Kim Jong Un observed a moment’s silence in the bitterest grief together with leading officials of the party, state and armed forces organs before going round the bier. Kim Rak Hui, Thae Jong Su, Kim Phyong Hae, Mun Kyong Dok, Ju Kyu Chang, U Tong Chuk and Kim Chang Sop. The imagery is of course similar to Kim Jong-il’s visit with the body of hist father Kim Il-sung in the very same building. The New York Times also covered the event. UPDATE 32 (2011-12-20): KCNA has posted two more videos of employees at the Kwangbok Supermerket (Kim Jong-il’s final official guidance destination) and the 4.25 Palace of Culture wailing and crying. See the videos here and here. Other similar videos can be found below in “Update 21”. Despite all the crying captured on film, the KCNA reporters, photographers and producers seem utterly unaffected. How professional of them. Also, The New York Times published a piece on all the crying. 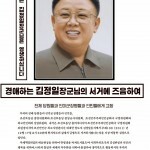 UPDATE 30 (2011-12-20): Martyn Williams has posted the latest issue of Rodong Sinmun on KJIs demise. See it here. UPDATE 29: Apparently emails to the North Korean embassies are getting through! An official at the Seoul embassy of a nation with a mission in Pyongyang said it was impossible to reach colleagues there Monday, suggesting that the regime had tried to block links with the outside world. In South Korea, defector groups were also unsuccessful in reaching contacts north of the demilitarized zone. “The North is refusing to accept any foreign guests because the world is watching and will try to analyze the regime’s next move by what kinds of guests come to pay respects,” said Sohn Jung-hoon, director of the North Korean Defectors’ Vision Network. BEIJING, Dec. 19 (Xinhua) — China on Monday sent condolences to the Democratic People’s Republic of Korea (DPRK) over the death of DPRK top leader Kim Jong Il. “We are shocked to learn that general secretary of the Workers’ Party of Korea (WPK), chairman of the DPRK National Defense Commission and supreme commander of the Korean People’s Army (KPA) comrade Kim Jong Il passed away and we hereby express our deep condolences on his demise and send sincere regards to the DPRK people,” said the condolence message. The late DPRK leader passed away from a great mental and physical strain at 08:30 on Dec.17 (2330 GMT Friday), on a train during a field guidance tour, the DPRK’s official KCNA news agency reported Monday. 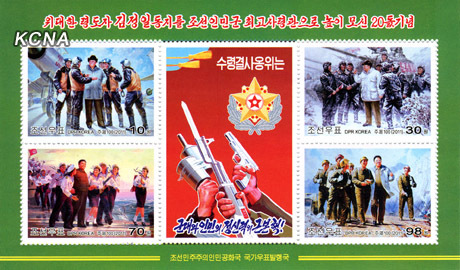 The condolence message, sent by the Central Committee of the Communist Party of China (CPC), the National People’s Congress Standing Committee, the State Council and the Central Military Commission to the DPRK’s WPK Central Committee and its Central Military Commission, DPRK National Defense Commission, Presidium of the Supreme People’s Assembly and the DPRK Cabinet, called Kim Jong Il a great leader of the DPRK people and a close friend of the Chinese people. The message said comrade Kim Jong Il had dedicated the whole of his life and rendered immortal service to the DPRK’s socialist revolution and construction. It noted that the late DPRK leader, a close friend of the Chinese people, had carried on and further developed the traditional friendship between China and DPRK. The Chinese government and people were deeply saddened by the demise of Kim Jong Il, who will be remembered forever by the Chinese people. The Chinese side believed that the DPRK will remain united as one with the leadership of the WPK and comrade Kim Jong Un, and turn their sorrow into strength, continuously advance towards the goal of building a strong and prosperous socialist nation and achieving sustained peace on the Korean Peninsula. China and the DPRK are close neighbors and stand together in good or bad times. The CPC and the Chinese government have always adhered to the policy of continuously consolidating and developing their traditional friendship with the DPRK, said the condolence message. The message added that the traditional party-to-party, state-to-state and people-to-people friendship between the two countries will be carried on and further developed. Xinhua also reports that Hu Juntao visited the North Korean embassy in Pyongyang, where it appears a memorial meeting was held for North Korean expats. UPDATE 26: The Korea Economic Institute posted a list of the ten names you should be aware of in the North Korean political power transfer. North Korean border guard units received orders at 1AM on the night of the 18th to close the border with China with immediate effect. “At the time even commanding officers did not know about the contents of the order, and as per the order to completely close the border, normal patrols in groups of two were stepped up to groups of four. 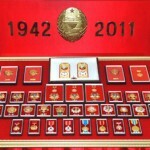 We only learned that the General had died from special broadcasts,” the source added. Thus, it is clear that the North Korean authorities took steps to avert civilian unrest and potential mass defection attempts by shutting down the border and reinforcing patrols prior to announcing Kim’s death. Ever since the North Korean authorities broke the news of Kim Jong Il’s death, they have been working through Party and administrative organs to establish an atmosphere of mourning. Workplaces and local government offices have, without exception, organized meetings to set in place the appropriate atmosphere. People’s Units have been emphasizing the ‘Last Instructions of Kim Jong Il’, and groups from schools and workplaces have been visiting statues of Kim Il Sung other major memorials to pay their respects. One Yangkang Province source commented to Daily NK late this afternoon that the streets of Hyesan were packed with people heading to a local monument to pay their respects, while not a single person was anywhere to be found near the market. There was an emergency summons issued at 2PM which required workers to return to their assigned workplaces, while People’s Unit meetings were held at local government offices, he said. UPDATE 24: Although I added it below, this afternoon Uriminzokkiri finally posted video of mourning North Koreans which was filmed outside of Pyongyang (Hamhung, Chongjin, Wonsan, Kaesong). You can see the video here. 1. Peter Beck’s CNN clip. 2. Marcus Noland’s Bloomberg clip and his comments on NPR. 3. Simon Cockerell from Koryo Tours was on CNN. 4. Here and here is commentary by Nick Eberstadt. 5. Here is a piece by Aidan Foster-Carter. 6. Scott Snyder wrote a piece for CNN. 7. Andrei Lankov on CNN. 8 Victor Cha in the New York Times. UPDATE 22: Some levity while I duck out for lunch: The Onion remembers Kim Jong-il. UPDATE 21: The Crying Game! Uriminzokkiri has uploaded footage of crying North Koreans to their You Tube account. There are eight videos. See them here (Mansudae Art Sudio), here (Committee for Cultural Relations with Foreign Countries–I actually know a few people in this video! ), here (State Theater), here (Chollima Steel Complex), here (older revolutionaries), here (undetermined department store), here (Pyongyang Department Store No. 1, Hamhung, Chongjin, Wonsan, Kaesong), and here (Pyongyang Textile Factory). KCNA has posted four videos. See them here (Mansu Hill / Pothong Gate), here (Mansudae Art Studo), here (Pyongayang Middle Shool No.1, Mansudae Children’s Palace, 326 Electric Wire Factory), and here (Mansu Hill). Very much the same behavior we saw when Kim Il-sung died. UPDATE 18: Martyn Williams has posted the Voice of Korea (Radio broadcast) of the Dear Leader’s death. Listen here. North Korea conducted at least one short-range missile test Monday, the same day it announced the death of leader Kim Jong Il, South Korea’s Yonhap news agency reported. Two South Korean military officials said they couldn’t immediately confirm the report, saying to do so would breach a policy of not commenting on intelligence matters. Both said any firing would be part of a routine drill and have little relation to Kim Jong Il’s death. They both spoke on condition of anonymity, citing policy. His bier will be placed at the Kumsusan Memorial Palace. Mourning period will be set from Dec. 17 to 29, Juche 100 (2011) and mourners will be received from Dec. 20 to 27. A farewell-bidding ceremony will be solemnly held in Pyongyang on Dec. 28. A national memorial service for Kim Jong Il will be held on Dec. 29. 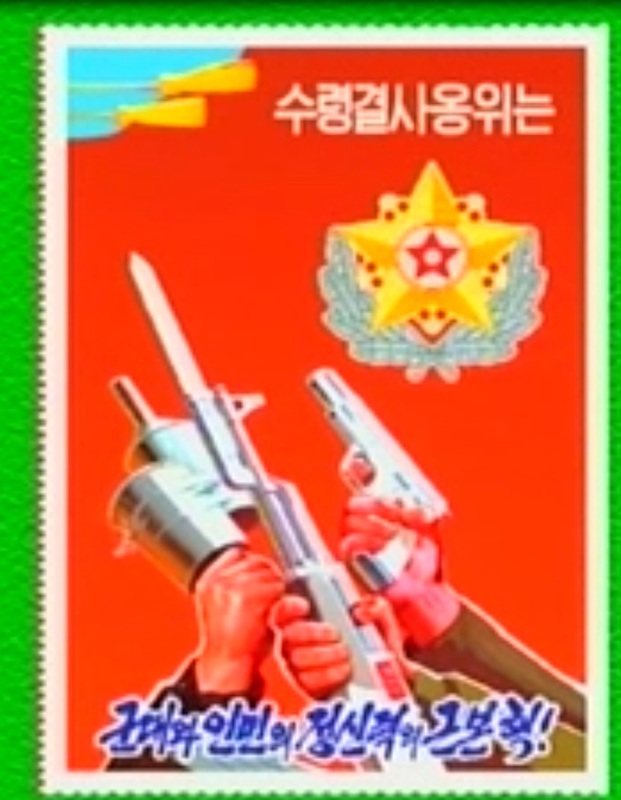 Mourning guns will be boomed in Pyongyang and in provincial seats timed to coincide with the national memorial service in Pyongyang and all the people will observe three minutes’ silence and all locomotives and vessels will blow sirens all at once. All institutions and enterprises across the country will hold mourning events during the mourning period and all provinces, cities and counties will hold memorial services timed to coincide with the national memorial service in Pyongyang. The institutions and enterprises will hoist flags at half-mast and musical and all other entertainments will be refrained. Foreign mourning delegations will not be received. SEOUL, Dec. 19 (Yonhap) — The North Korean military and people have pledged to follow the leadership of the late leader’s heir apparent Kim Jong-un to carry on the legacy of the communist state, its state media said Monday, amid growing uncertainty over the power transition. 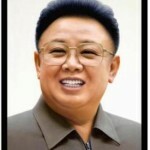 The North’s state media reported earlier in the day that 69-year-old Kim Jong-il died of a heart attack two days earlier. Following that announcement, regional powers are paying close attention to whether Kim’s youngest son and heir apparent Jong-un, aged in his late 20s, would successfully take the helm of the impoverished communist state. Following on from news of the closure of North Korea’s border with China, Daily NK has learned that armed soldiers have been deployed en masse to the center of the city of Musan. Grasshopper traders are those traders who operate in the alleyways outside officially sanctioned markets in North Korea. As reported earlier this afternoon by Daily NK, official markets have been shuttered by the North Korean authorities. “Now there are armed troops standing guard at four meter intervals downtown, and every available National Security Agency and People’s Safety Ministry agent is out there on guard duty,” the source added. According to the source, a number of long sirens rang out immediately after the news of Kim Jong Il’s death was reported by state media, and it was after this that troops and the security forces emerged onto the streets and ordered everyone to return to their homes. UPDATE 13: Uriminzokkiri is still uploading videos to YouTube as they do every day…business as usual. The Korean Friendship Association web page was down, but seems to be back up. Neither organization has posted any information on the death of the Great Leader. North Korea has announced that it has entered a period of formal mourning following the death of Kim Jong Il lasting from the 17th, the day of his passing, until the 29th. Following the official announcement of Kim Jong Il’s death today, North Korea has imposed rigid social controls, including the complete closure of markets. UPDATE 11: (via Luke) The day that Kim Jong-il’s death was announced (Dec 19th) is South Korean President Lee Myun-bak’s birthday! 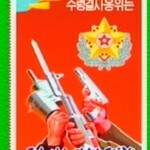 UPDATE 10: Michael Madden has posted a family tree, residency photos, as well as some other infomation on Kim Jong-il. See it all here. UPDATE 9: Peter Beck is on CNN. Funeral will be on December 28. Foreign delegations are not invited to the funeral. UPDATE 8: The Korean version of the KCNA web page contains several additional stories that are not on the English version (Thanks, Luke). I have provided an English translation of these names here (Excel). Kim Jong-un is number 1 on the list. Kim’s sister, Kim Kyong-hui is number 14. Her husband, Jang Song-thaek, is number 19. (And after I did all that work, KCNA published a list of names in English). The North Korean regime on Monday issued a list of 232 people who make up the funeral committee for dead leader Kim Jong-il. Experts believe the order more or less matches their rank in the pecking order. Kim’s son and designated heir Jong-un is at the top of the list. One reason could be that Kim Jong-un is not yet a member of the commission, unlike his father, who ruled the country through it. Kim Jong-un’s aunt Kim Kyong-hui and her husband Jang Song-taek are in 14th and 19th in the list, even though Jang was widely believed to be the eminence grise behind Kim Jong-il. Kim’s exiled eldest son Jong-nam is not listed, nor are his middle son Jong-chol and virtually exiled half-brother Pyong-il, the perpetual North Korean Ambassador to Poland. Global rating agencies said Monday that the death of North Korean leader Kim Jong-il would not immediately affect ratings assigned to South Korea despite increased market uncertainties and geopolitical risks. According to Seoul’s finance ministry, Standard & Poor’s, Moody’s Investor Service and Fitch Ratings said they would not adjust ratings on South Korea given its strong economic fundamentals and the soundness of the financial sector. UPDATE 5: Japan has issued a public statement of regret about KJI’s death. Also (via CNN), the flag at the North Korean embassy in Beijing has been lowered to half-staff. The South Korean Won-U.S. Dollar exchange rate has been rising rapidly following news of Kim Jong Il’s death. Starting at 1,160 Won, the South Korean Won had struck 1,199 by lunchtime, although it subsequently declined to 1,185 Won. Here is the video on YouTube (via Uriminzokkiri). Here is the announcement with an official voice over in English. Pyongyang, December 19 (KCNA) — Leader Kim Jong Il had received medical treatment for his cardiac and cerebrovascular diseases for a long period. He suffered an advanced acute myocardial infarction, complicated with a serious heart shock, on train on December 17, Juche 100 (2011) for a great mental and physical strain caused by his uninterrupted field guidance tour for the building of a thriving nation. Pyongyang, December 19 (KCNA) — Kim Jong Il, general secretary of the Workers’ Party of Korea, chairman of the DPRK National Defence Commission and supreme commander of the Korean People’s Army, passed away from a great mental and physical strain at 08:30 December 17, 2011, on train during a field guidance tour. The WPK Central Committee and Central Military Commission, DPRK National Defence Commission, Presidium of the Supreme People’s Assembly and Cabinet released a notice on Saturday informing the WPK members, servicepersons and all other people of his passing away. SEOUL, Dec. 19 (Yonhap) — North Korea will make a “special” broadcast at noon Monday, its state television and radio said, without giving any further details. North Korea has aired special broadcasts in the past when leader Kim Jong-il was re-elected as the chairman of the powerful National Defense Commission. Pyongyang, December 19 (KCNA) — An important notice will be released at this noon. NK Leadership Watch posted a link to the Xinhua report which claims Kim passed away on Saturday the 17th. Kim Jong-il’s last public appearance was at the Hana Music Information Center (a joint venture with Phoenix Commerical Ventures) and a remodeled Kwangbok Department Store which was reported on Dec 15. See a satellite image of the Hana building here and the Kwangbok Supermarket here. Major media coverage (updated periodically): Washington Post (and here), BBC, New York Times (and here), Los Angeles Times, Business Week, Xinhua. This entry was posted on Sunday, December 18th, 2011 at 10:09 pm and is filed under Kim Jong-il's death, Political economy. You can follow any responses to this entry through the RSS 2.0 feed. Both comments and pings are currently closed. great blogging Curtis, thanks for keeping us all updated, great work late into the night! am i the only one who thinks he died a while ago and they were waiting till an appropriate time to announce this? He died two days before the announcement, and they pointed that out in the announcement. I would reckon that whatever power struggle is predicted already occurred during the day in between, and General Kim Jong Eun emerged ahead. Thanks for the updates. this is always the blog to visit for N.K. updates. A portion of the front page article mentioning Kim Jong-Eun is translated. Wow. So much crying! Did somebody’s kid not get into Harvard? Unless something has changed in the last few hours then there hasn’t been a shut down of communications with all Embassies in Pyongyang, communication with embassies there by email has been working. Maybe the phone system, was down though, by design or overloaded even? Great work Curtis. It is much appreciated. KFA seems to be silent on this. My guess is that Alejandro Cao de Benos de Les y Pérez is busy plotting his own coup.